HangSeng Magnetech uses only licensed neodymium and licensed magnet materials for all applications. 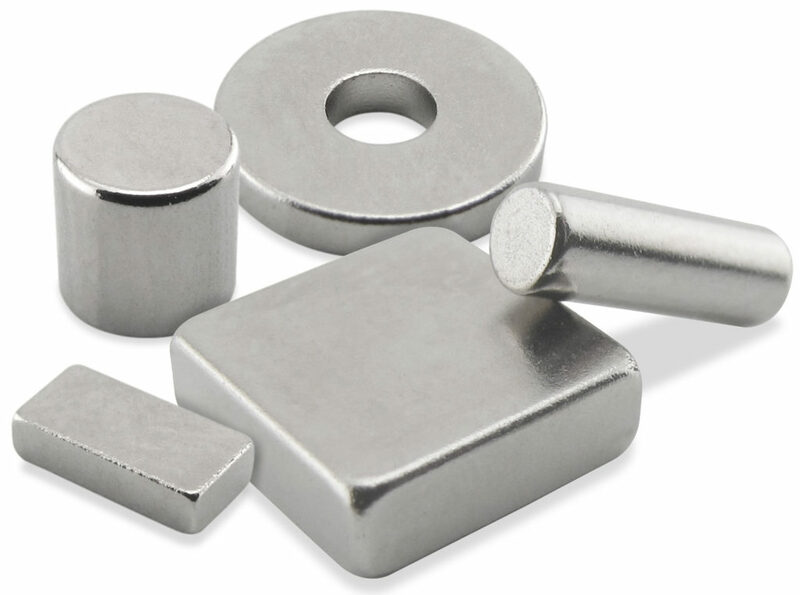 Sintered neodymium-iron-boron (Nd-Fe-B) magnets are licensed rare earth magnets which are the most powerful commercialized permanent magnets available today, with maximum energy product ranging from 26 MGOe to 52 MGOe. Neodymium Iron Boron is the third generation of permanent magnet developed in the 1980s. It has a combination of very high remanence and coercivity and comes with a wide range of grades, sizes and shapes. With its excellent magnetic characteristics Nd-Fe-B offers flexibility for new designs or as a replacement for traditional magnet materials such as ceramic, Alnico and Sm-Co for achieving higher efficiency and more compact devices. A powder metallurgy process is used in producing sintered Neodymium magnets. Although sintered Neodymium is mechanically stronger than Samarium Cobalt magnets and less brittle than other magnets, it should not be used as a structural component. Selection of Nd-Fe-B is limited by temperature due to its irreversible loss and moderately high reversible temperature coefficient of Br and Hci. The maximum application temperature is 200 °C for high coercivity grades. Nd-Fe-B magnets are more prone to oxidation than any other magnet alloys. If Nd-Fe-B magnet is to be exposed to humidity, chemically aggressive media such as acids, alkaline solutions salts and harmful gases, coating is recommended. It is not recommended in a hydrogen atmosphere. For as-pressed material, tolerance on the thickness (direction of magnetization) is +/– .005”. Other dimensions are +/– 2.5% or +/– .005”, whichever is greater. According to International Magnetics Association/Magnet Materials Producers Association (IMA/MMPA) standards, visual imperfections such as hairline cracks, porosity and minor chips are commonly found in sintered magnets. A chipped edge is considered acceptable if no more than 10% of the surface is missing. Cracks are acceptable as long as they do not extend across more than 50% of the pole’s surface.